What Day Of The Week Was August 1, 1966? 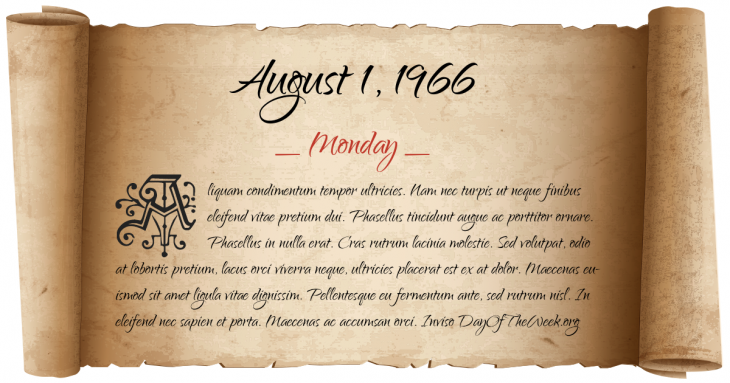 August 1, 1966 was the 213rd day of the year 1966 in the Gregorian calendar. There were 152 days remaining until the end of the year. The day of the week was Monday. A person born on this day will be 52 years old today. If that same person saved a Quarter every day starting at age 7, then by now that person has accumulated $4,175.00 today. Here’s the August 1966 calendar. You can also browse the full year monthly 1966 calendar. Purges of intellectuals and imperialists becomes official People’s Republic of China policy at the beginning of the Cultural Revolution. Who was born on August 1, 1966?